US unsealed series comply with SAE/USCAR-2. This series consits of 0.64mm, 1.5mm, 2.8mm, and 6.3mm types classified according to terminal size, coverring an extensive array of applications from signal to power circuits. 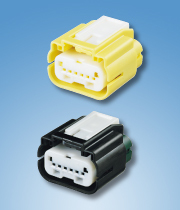 - The connector mechanism only allows the TPA to be set when the terminal is completely inerted. - TPAs are pre-mounted on housings, and are structured to enable setting by the same simple operation regardless of the number of ways, improving TPA operation. 0.35〜1.0mm2 (AWG : 22-16) Initial 10mΩMax. 20MΩMin. 5〜20mm2 (AWG : 10-4) Initial 1.5mΩMax. 20MΩMin.